Top Games US ran “The Battle of Evony”, a Super Bowl commercial promoting the mobile game Evony: The King’s Return. George Washington (Aaron Eckhart), King Arthur (Jeffrey Dean Morgan) and Empress Wu Zetian (Fan Bingbing) are brought together from pivotal beginning points in Cornwall, Virginia and Shaanxi in an online two-minute cinematic film, their paths of alliance converging over time in an epic battlefield. 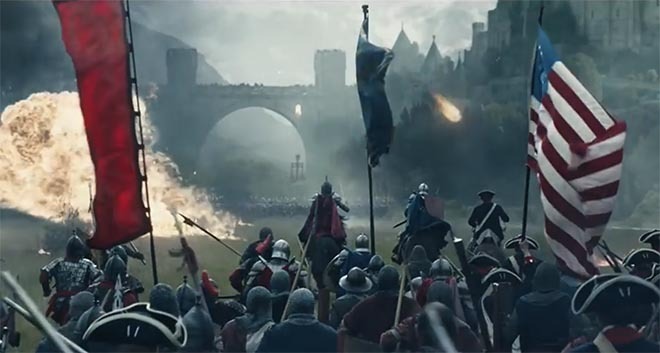 The culminating battle was featured in a 30-second ad shown during the third quarter of the Super Bowl on Sunday, February 5th. Eleven additional ads will air later in the year, expanding the story line with forge and broken alliances. The Battle of Evony King’s Return campaign was developed at BSSP, San Francisco, by chief creative odficer John Butler, executive creative directors Keith Cartwright and Tom Coates, creative directors Mark Krajan, Chris Toffoli, associate creative directors Sinan Dagli and Luke Zehner, senior art director Lydia Dunay, senior copywriter Nick Zacher, director integrated production Vince Genovese, senior producer Lori Pisani, group account director Cristiano Alburitel, account supervisor Danielle Patipa, account executive Patrick Gregory, business affairs Nihad Peavler. Filming was shot by director Henry Hobson via Furlined with president Diane Carter, executive producer Ben Davies, producer Aris McGarry and director of photography Alwin Kuchler, production designer Dominic Watkins, storyboard artist Mark Bristol, working with local production companies Goodoil Films and Icon Films. Editor was Stewart Reeves at Work Editorial with assistant editor Josh Sasson, producer Lynne Mannino and executive producer Marlo Baird. Visual effects were produced at Method Studios by VFX supervisor Ben Walsh, producer Mike Zavala, senior executive producer Stephanie Gilgar, CG supervisor Lee Carlton, compositing suprevisor Chris Bankoff, compositing lead Toma Bowen and VFX coordinator Kyle Leonard. Sound and music were produced at Q Department. Sound was mixed at One Union by Eben Carr. Music is “Keyboard suite in D minor (HWV 437), Sarabande” by George Frederic Handel.